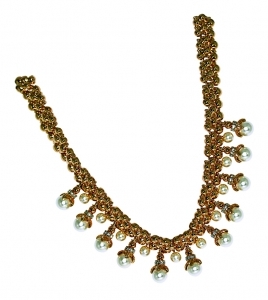 V&A Jewellery - Multiple Cream Faux Pearl Collar: A variation on the haute couture theme, this sumptuous collar necklace of multiple pearls in a pendant style is also set with crystals. This piece is inspired from an object in The Victoria and Albert Museum, London. V&A Jewellery - Hooped Earrings with Grey Faux Pearls: A variation on the haute couture theme, these sumptuous earrings with pearls in a pendant style is also set with crystals. V&A Jewellery - Rope and pearl pendant - an elegant design evoking the haute couture era of the 1950's. V&A Jewellery - Multiple Grey Faux Pearl Collar: A variation on the haute couture theme, this sumptuous collar necklace of multiple pearls in a pendant style is also set with crystals. V&A Jewellery - Rope & Fauz Pearl Clip On Earrings: These earrings have an elegant design evoking the haute couture era of the 1950's. V&A Jewellery - Hooped Earrings with Cream Faux Pearl: A variation on the haute couture theme, these sumptuous earrings with faux pearls in a pendant style is also set with crystals. V&A Jewellery - Pearl and Crystal bangle: Inspired by a bracelet of gold set with sapphires, pearls and rose-cut diamonds, made in Russia, St Petersburg, about 1890. V&A Jewelled - Grand Jewelled Vert Earrings: Inspired from the original emerald and diamonds necklace and earrings parure which was made in 1806 by Nitot & Fils, the French crown jewellers and given by Napoleon and Josephine to thier adopted daughter Stephanie de Beauharnais on her marriage to the heir of the Grand Duke of Baden.